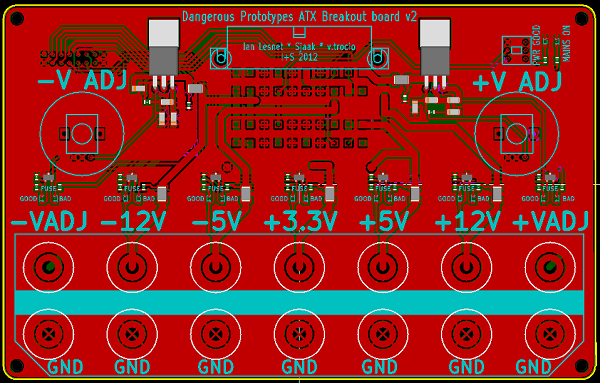 Over the last week we re-visioned the ATX power supply breakout board in KiCAD, free of the confines of Eagle’s 100mm by 80mm cell. We chose the ATX board because it’s already at the limit of the free version of eagle, and it’s filled with big connectors that can’t be miniaturized. This version builds on the already popular ATX Breakout Board v1.1, but adds new features and hackability. Stuff that simply wouldn’t be possible without the unlimited routing area available from the open source alternative to our usual program. 2×8 0.1” header connected to all the power rails and the control lines of the PSU, including the adjustable ones. Expect a full report on our KiCAD experience tomorrow. More about the updated design below. Comments and suggestions are always welcome, leave them in the comments here, or head to the forum. This breakout board can recycle a common ATX computer power supply into a bench lab supply. It breaks out all of the rails to screw terminals that also take a banana plug in the top for quick connections. New in version 2 are positive and negative adjustable rails, provided by the LM317 and LM337 voltage regulators. They output between 1.5 volts and 10.5 volts (+/-) adjustable via two potentiometers. As in previous versions of the ATX board, each rail has 1.25 amp fuse. LEDs that indicate that voltage is good on each rail. Version 2 adds an additional LED on each rail that lights when a fuse is blown. This is implemented with a PFET and a few resistors. Since we designed version 2 in KiCad, the size limitations of Eagle were no longer constraining us. We added ground (GND) terminals to each of the output lines. Now there’s redundant ground connections like the original breakout prototype. Sjaak will be so happy about this. Some people want to put the breakout in the top of a case and connect the ATX jack from below. In this version we added an additional ATX connector footprint to make it easier to do that. For complete hackability, we broke out all the output rails and ATX PSU control lines to a 2×8 0.1” pitch header. Schematic and PCB were designed with KiCad EDA, download the latest project files from our Google Code project page. This entry was posted on Wednesday, September 12th, 2012 at 5:00 pm	and is filed under Prototypes. You can follow any responses to this entry through the RSS 2.0 feed. You can skip to the end and leave a response. Pinging is currently not allowed. I also started using Kicad and it seems to be a must !! Good to see open hardware using open software! The CP1 symbol is a more common or at least to my mind better looking symbol for an electrolytic capacitor. You might want to use it instead of the the normal CP symbol. 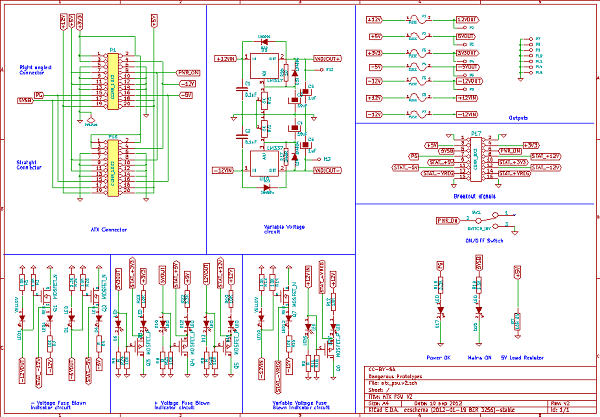 +1 for KiCAD, should be adopted by all OSHW enthusiasts! Can it middle-button-pan yet, or do they plan that extraordinarily never-before-heard-of ground-breaking innovative feature as the Big Thing For The 22nd Century? plus,minus adjustable – yes very good! backward or downward facing connector – yes yes yes! I was trying to figure out the best way to do this with version 1 as I really want to mount on the power supply box itself to reduce the rats nest effect. Minor nit, I think 1.25 amps on +5 and +12 is too small, easily replaced though. I sometimes would like to power small DC motors from the plus 12 without an extra cable. Nice changes but you still haven’t done anything to improve the biggest problem with this board – the 1.25A fuses. Most ATX power supplies supply 25A or more. The fuses are crippling. We intended this as a feature and not a bug.25A is a huge amount of current for small projects. We don’t want to deal with the full 25A, so we added the 1.25A fuse. I understand but I think most people who are using an ATX power supply are using it because they have high current needs. Otherwise, a scrap wall wart is a much easier solution. Most of the negative comments I got about my ATX build were regarding the fuses. Perhaps adding high current fuses as an option would be worth testing. My guess is that more people would be interested in that version. I have a large collection of wall-warts, but if I wanted +12,-12,+5 and +3.3 all at once, the ATX supply is still a nice choice to have convenient screw terminals with all four voltages. I seldom need the higher current. But if you do, it’s just a zero-ohm jumper away. *I feel like a real newbie. I am using Kicad for a project for the first time. I have previously used ExpressPCB which makes it very easy. What files do I need to assemble to send to the fabricator to have some prototypes made? That said, you should ask your fab house what they need. When is this going to be available at SeeedStudio? I’m completely new to KiCAD. When I load this file, it says it is missing the libraries “special” and “dp_devices”. Where do I find them? This is on a brand new install of the latest KiCAD on Windows 8.1. OK, I found the “special.lib” and “dp_devices.lib” but the ATX connector is not in there. I found an ATX_24 library, but KiCAD complains that it isn’t an Eschema library and won’t open it. Is anyone still watching this? Too bad Dangerous Prototypes never finished this and uploaded. I’m not 100% satisfied with it, but it is much better than the earlier version that they still sell.